And not a moment too soon, either. We laid in a supply of sweet rolls for Easter Sunday breakfast and ice cream for after dinner which I enjoyed tremendously. Possibly to excess, although it didn't seem like it at the time. And the garden has decided that it really is spring. The roses in the front are exploding. 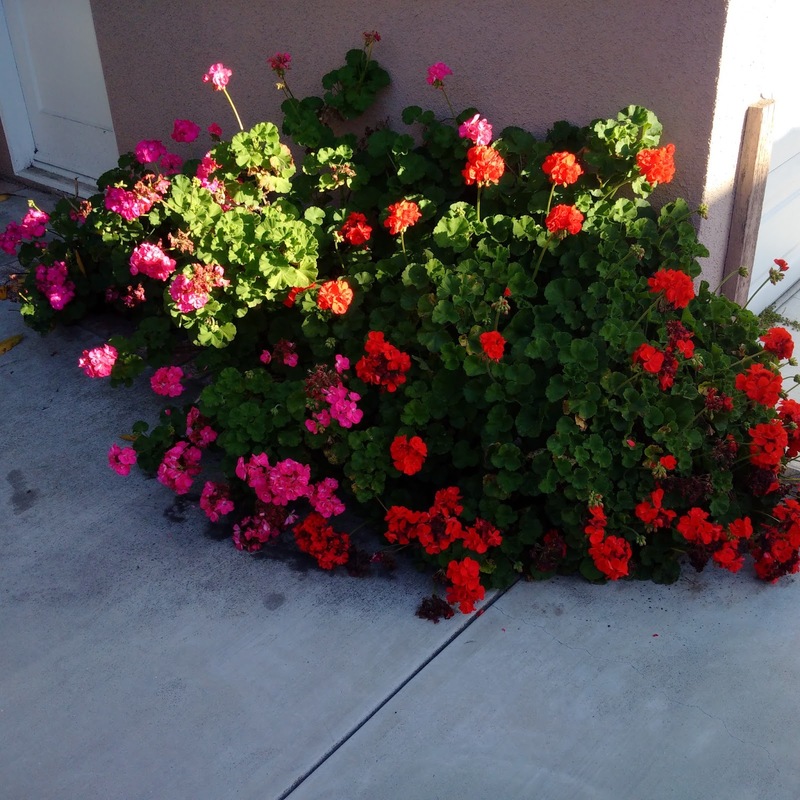 And this tiny little plot of geraniums next to the garage are joining in. 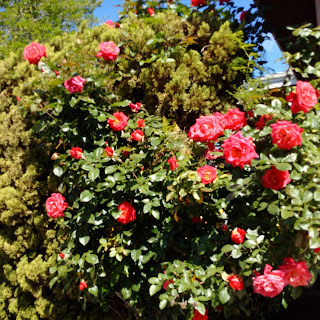 I can't find the picture of the azaleas but they are, too. 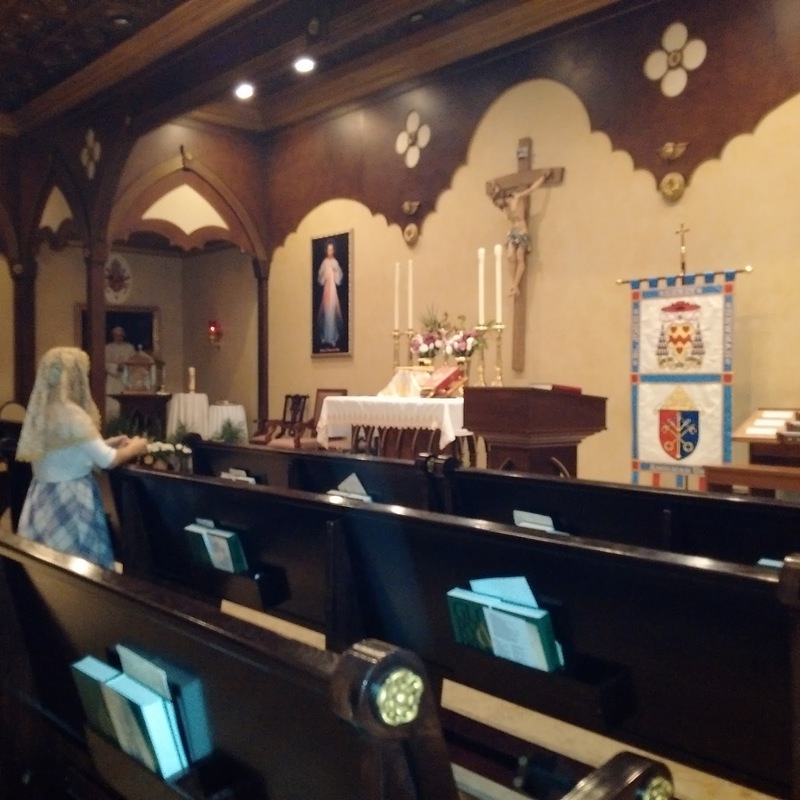 The picture above is of our little chapel directly after our beautiful Holy Saturday liturgy. The tomb is empty and the tabernacle isn't. There are all sorts pictures of our Holy Week service here and there on the net. Which is kind of odd as I didn't see anyone taking them. But there they are. You can find some of them on the parish's FB page here. Hæc dies quam fecit Dominus . . .
. . . exultemus et lætemur in ea! Happy Easter Monday. I can't come up with a proper connection to the holiday for this piece. And so for no particular reason other than that I like the tune and the playing, here is Anatoly Isaev playing Cuckold Come Out of the Amrey on the Scottish lowland pipes. In Russia. "A conjunction considered to be both deliberate and profoundly meaningful"
That would be today's festal conjunction of Annunciation Day and Good Friday. The Clerk of Oxford's explanation here should not be missed. Both beautiful and fascinating. In honour of International Bagpipe Day, i.e., today, here are three, um, international bagpipes playing a Swedish tune on some good-sounding pipes with sweet harmonies. It's called Vännens Långdans, which we are told means "Friends Långdans". The Swedish pipe player is Vickie Swan but the other two ladies aren't identified. Chrism Mass . . .
. . . Ordinariate style. This will be the first one any of the three Ordinariates have celebrated. And the first one using Divine Worship - The Missal. Alas, it will also be in Washington, D.C., a couple of thousand miles -more or less - from here. So your servant will not be in attendance. But if you're in the neighbourhood come St Patrick's day, NLM provides the details here. Once again I am risking my reputation (what there is of it) and relying solely upon the accuracy of the internet. Which is to say, that title up there had better mean "Happy St David's Day" in Welsh or I shall be mightily embarrassed. Grant to us, almighty God: that the loving intercession of blessed David, thy Confessor and Bishop, may protect us; that while we celebrate his festival we may imitate his steadfastness in the defence of the Catholic faith. Through Christ our Lord. Amen. Feed me now and ever more! Now we are talking SSPX here. I doubt English at Benediction is going to fly. But in fact, the words to Tantum Ergo fit Cym Rhondda pretty much perfectly. Perhaps a touch livelier than Benediction is meant to be. But what a great tune it is.